The Innovation SuperNetwork is a unique regional programme, helping to cultivate a stronger innovation eco-system in the North East of England and support innovative businesses. The programme is expanding to include support delivered through cluster organisations and business groups, ensuring that innovation support is available to a much wider range of businesses than can currently access it. In addition, we are working closely with partners on increasing the level of support available in the region for open and collaborative innovation projects. Dynamo is a membership organisation and its mission is to grow the North East’s digital sector. It achieves this through stimulating collaboration, championing innovation, developing skills and increasing the profile of the region’s digital hotspot. Dynamo has various focus areas including cyber, digital construction, skills, shared services, professional services and FinTech. Dynamo plans to grow these specialisms and the activity with businesses covering these specialisms over the coming months and years. The SuperNetwork is working with Dynamo to develop and lead the strategy and delivery plan for selected specialisms and to ensure strong engagement from organisations across the North East tech sector, particularly with small and medium sized businesses. We require a Cluster Engagement Manager to join the team. This role will be co-located with Dynamo and is high-profile, externally-focused and brings the potential to have a huge impact on our region. The ideal person will be a confident communicator with considerable stakeholder engagement and management experience. They will have a track record of working with organisations in both the public and private sector and be confident establishing relationships with large corporate organisations and SMEs. The ideal candidate will be experienced in working with industry networks or cluster groups, determining sector needs, identifying shared goals and delivering successful projects that meet stakeholder and sector requirements. A track record in seeking out and securing funding for new initiatives is also required. Knowledge and understanding of the digital sector whilst desirable is not essential. The candidate must have a strong understanding of innovation from first-hand experience. They must be able to spot opportunities for projects and be able to function effectively in a fast-moving, multi-stakeholder environment. Strong communication skills are essential and some experience of account management would be useful in working with partner organisations. Knowledge of how innovation projects can be structured and financed is a bonus. 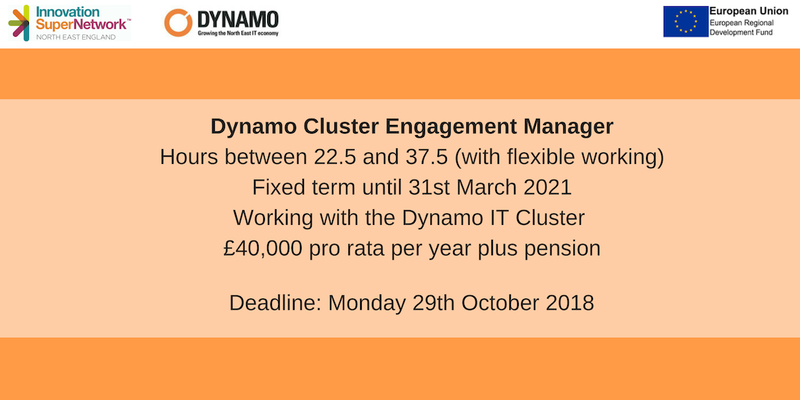 The key responsibilities of the role are to work with Dynamo to deliver business engagement and innovation activities to benefit the cluster members in the region. If this opportunity is for you, the first step is to forward your CV and covering letter to elaine@supernetwork.org.uk by Monday 29th October. Interviews are planned for the 5th November 2018 in Sunderland.